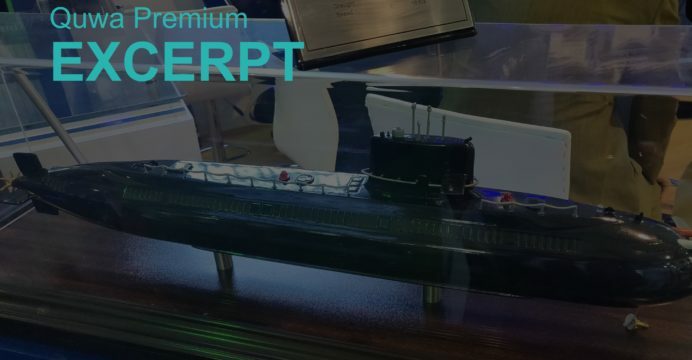 In 2015, Pakistan’s announcement about procuring eight new air-independent propulsion (AIP)-powered submarines from China kicked-off the Pakistan Navy’s (PN) modernization efforts. Initially, it had appeared that the new submarines – designated the Hangor-class – would form the entirety of the PN’s big-ticket procurement, largely due to the fact that Pakistan is fiscally constrained and that the PN typically does not receive as much in procurement funding compared to the Army or Air Force. However, while the PN added large surface ships to its procurement pipeline, there is little doubt that its new Hangor-class submarines will, ultimately, have the greatest impact in South Asia’s maritime domain. As discussed in previous Quwa articles, this is due to the fact that the Hangor-class will likely (1) carry the PN’s strategic deterrence element through submarine-launched cruise missiles (SLCM), (2) offer credible anti-ship warfare (AShW) and anti-submarine warfare (ASW) capabilities, and (3) leverage both numbers and low detectability to serve as a threatening anti-access and area-denial (A2/AD) asset. Quwa Premium subscribers can access the full article here.